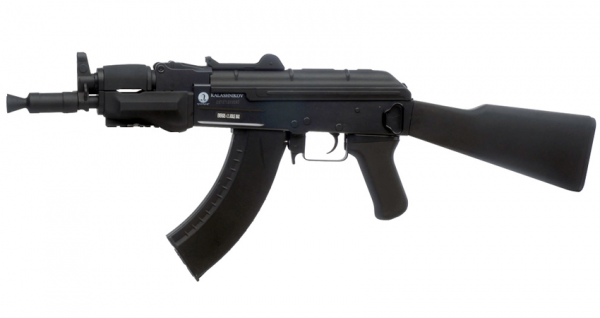 The AK-74 took the tried and true AK-47 platform and improved upon it. This variant includes a much more compact form factor at an overall ~28" length allowing for a perfect balance between size and control. With all the features, including licensed trademarks, that AK connoisseurs look for in a rifle, this AEG excells in close-quarters skirmishes. Firing at 330 FPS with 0.20g BBs and sporting a 550 BB high capacity magazine allows this rifle to be used competitively on both the field and in the airsoft arena. It's full stock allows for a wide assortment of batteries to be used. Included with the rifle is a 8.4 V 1100 mAh NiMH battery and 8.4 V 250 mA standard battery charger to get you out on the field faster! A picatinny/weaver rail is integrated into the handguard allowing for attachment of accessories such as lights, lasers, grips, and more to take your game to the next level. Externally, the rifle is constructed from ABS plastic and metal to keep the price low and durability high. Iron sights atop the metal dust cover and outer barrel make shots count at any distance. Internally, the metal gearbox is built to outlast those with plastic or nylon gears. Sling loops allow for the rifle to be carried safely and securely when in staging or on the run.